The Relax Chair Baby Boy, Girl or Neutral wicker rocker gift basket is a bountiful gift. This beautiful wicker Relax Chair (24 x 24) comes with a variety of products. 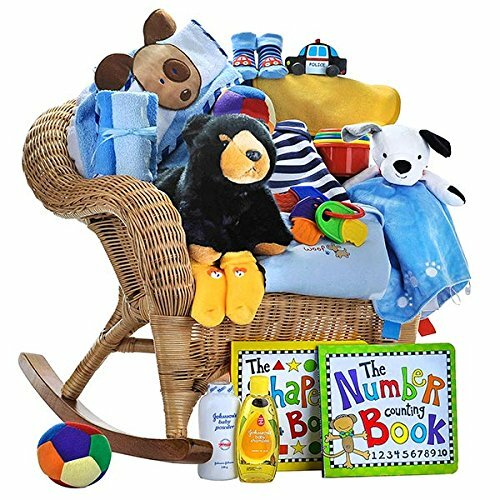 Included in this basket is The Number Counting Book, The Shape Book, 100 ml Johnson & Johnson baby oil and shampoo, 100 mg baby powder, play stacking cups, play key ring, plush ball with rattle, car detailed booties, toy car, stuffed plush bear, dog blanket, two bibs, three wash cloths, two cotton onesies and finished with a hooded dog bath towel.